Yesterday, coming soon: Only Yesterday, one of the very few Studio Ghibli titles never released in English, is finally getting that distinction thanks to the fine folks at GKIDS. The title's getting a theatrical release with, presumably, home video to follow some time after that. Slahsfilm's synopsis for Yesterday: "about a 27-year-old unmarried office worker who travels to the countryside while reminiscing about her childhood in Tokyo. The memories of her days as a schoolgirl in 1966 cause her to question whether she has been true to herself." In other words, it's more along the lines of Whisper of the Heart or From Up on Poppy Hill — realistic stories rooted in daily life — than the more fantasy-driven entries in the the Ghibli catalog. But that's also the exact reason I'm all the more hyped to see it. Live Ghosts: Stage adaptations of anime properties in Japan are apparently as common as, well, just about any other kind of adaptation of anime properties over there. Ghost in the Shell ARISE now has a stage play of its own (2nd link) with an excellent-looking actress (Kaede Aono) as Motoko Kusanagi. That prompted some notes to the effect that if we're filming Ghost in the Shell in the West, why didn't we slot Rinko Kikuchi into that role? Good question. Distantly related: ARISE writer Tow Ubukata — also known for Mardock Scramble and the lamented second season of Psycho-Pass — was recently arrested on charges of domestic violence. Oshii's newest labor: Mamoru Oshii's Patlabor: Tokyo War — a live-action Patlabor movie — is set to be screened at the Montreal World Film Festival. This is apparently the shorn-down 93-minute version of the film, which was a box-office dud in Japan; Oshii's preferred version runs 20+ minutes longer. This is one of the few times where I'm torn: not having the director's preferred version of anything is always a minus — but sometimes, with Oshii, less really is more. 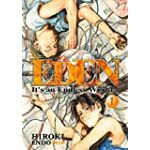 East of Eden and out of print: Hiroki Endo's amazing post-apoc manga Eden: it's an endless world! has been — had been — making its way into the hands of English-reading audiences for years now. Unfortunately, Dark Horse has put the title on hiatus, although they are still interested in resurrecting it at some point. It's a shame; Eden was one of the titles I would be most inclined to recommend unhesitatingly to people who have no experience with manga. Copies of the existing fourteen volumes are out there with varying degrees of availability, but several volumes in the middle of the run are terribly scarce and change hands at inflated prices. Maybe we can get this one digitally?